A makeshift memorial built in the Staten Island, New York at the spot where Eric Garner died at the hands of law enforcement last year, burned down on Monday evening. Preliminary reports suggest a candle started the blaze. According to the New York Post, the Staten Island memorial caught fire late on Monday, which was also Dr. Martin Luther King Jr. Day. Police sources told the paper that a candle was believed to have accidentally fallen and burned down the memorial. Hours earlier, thousands marched across New York City and in other cities across the United States as massive rallies were held in honor of the memory of King, the slain civil rights leader. Following the death of Garner in July 2014 and similar incidents suffered by other African-Americans in recent months, this year’s MLK Day activities largely focused on raising awareness of the contentious law enforcement policies that seem to run against the ethos of equality championed by King ahead of his death in 1968. 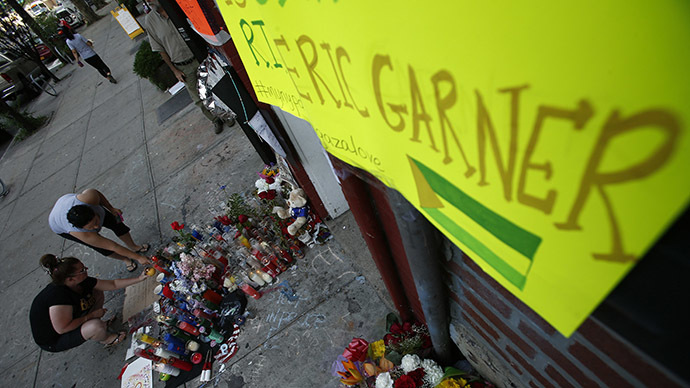 Garner, who was 43 years old, died last summer after a New York Police Department Officer placed him in a chokehold. He was attempting to detain the man for allegedly illegally selling cigarettes. His death was amplified one month later when Michael Brown, a black teenager, was shot and killed by a white police officer in Ferguson, Missouri. According to Vocativ, civil rights leader Rev. Al Sharpton led a candlelight vigil through Staten Island earlier on Monday evening alongside the family of Mr. Garner and stopped at the Brooklyn graves of two NYPD officers killed last month during a fatal ambush. Last September, a memorial built at the spot where Brown was gunned down in Ferguson two months earlier similarly burned down. Police at the time speculated that candles had been responsible for that incident as well.